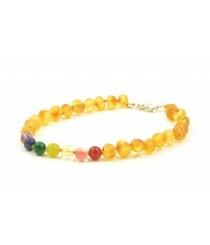 Amber Anklets There are 15 products. 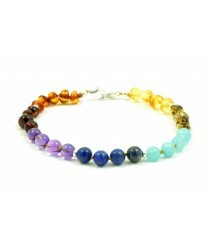 Our collection of Amber anklets for adults consists of 6 unique designs that combine different color Amber beads. 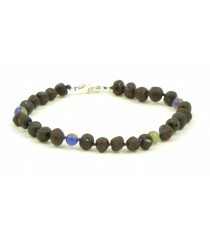 Anklets come with Silver Sterling clasp, which makes these accessories look very stylish on the leg. 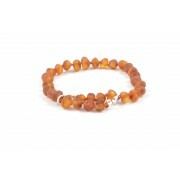 When hand making these anklets we only use genuine Baltic Amber beads so you can be sure that they will provide maximum health benefits to adults who choose to wear them. Most adults choose to wear these anklets because they are believed to be helpful in minimizing pain and enhancing immune system and providing other benefits. 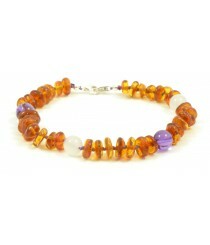 Product ID: J101; Short Description: Polished Cognac Amber Anklets with Sterling Silver clasp and White Agate, Amethyst Semistone; Color: Cognac; Style: Half-baroque; Amber Beads: Polished; Standard Lengths: 18-24 cm. Average Weight: ~5 grams; Semistone: 8mm. 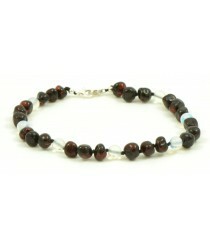 Product ID: J102; Short Description: Raw Cherry Amber Anklets with Sterling Silver clasp and Cats Eyes Semistone; Color: Cherry; Style: Baroque; Amber Beads: Raw; Standard Lengths: 18-24 cm. Average Weight: ~5 grams; Semistone: 6mm. 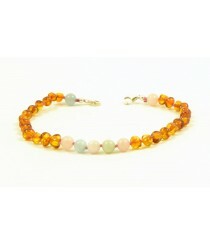 Product ID: J103; Short Description: Polished Cherry Amber Anklets with Sterling Silver clasp and Opalite Semistone; Color: Cherry; Style: Baroque; Amber Beads: Polished; Standard Lengths: 18-24 cm. Average Weight: ~5 grams; Semistone: 6mm. 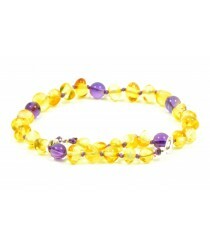 Product ID: J104; Short Description: Polished Lemon Amber Anklet with Sterling Silver clasp and Amethyst Semistone; Color: Lemon; Style: Baroque; Amber Beads: Polished; Standard Lengths: 18-24 cm. Average Weight: ~5 grams; Semistone: 6mm. 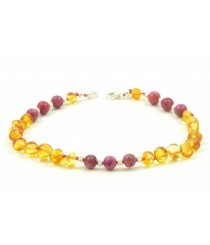 Product ID: J105; Short Description: Polished Honey Amber and Rose Agate Anklets with Sterling Silver 925 clasp ; Color: Honey; Style: Baroque; Amber Beads: Polished; Standard Lengths: 18-24 cm. Average Weight: ~5 grams; Semistone: 6mm. 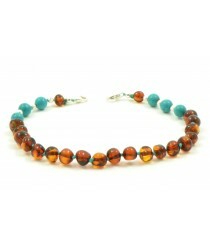 Product ID: J106; Short Description: Cognac Amber and Turqouise Anklets with Sterling Silver 925 clasp; Color: Cognac; Style: Baroque; Amber Beads: Polished; Standard Lengths: 18-24 cm. Average Weight: ~5 grams; Semistone: 6mm. 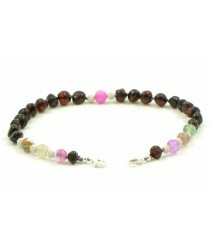 Product ID: J107; Short Description: Cherry Amber and Colorful Agate Anklets with Sterling Silver 925 clasp; Color: Cherry; Style: Baroque; Amber Beads: Polished; Standard Lengths: 18-24 cm. Average Weight: ~5 grams; Semistone: 6mm. 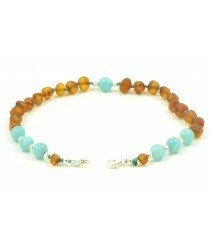 Product ID: J108; Short Description: Raw Cognac Amber and Aquamarine Anklets with Sterling Silver 925 clasp; Color: Raw Cognac; Style: Baroque; Amber Beads: Unpolished; Standard Lengths: 18-24 cm. Average Weight: ~5 grams; Semistone: 6mm.